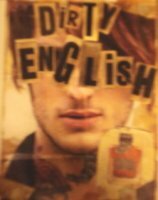 Presenting the scent of irresistible bad boys all over the world...Dirty English exclusive to Bloomingdale's. This new "Manarchy" in a bottle has a passion-inducing mix of peppered mandarin, blue cypress, black leather, ebony wood and amber musk. Live hard, live fast, live loud, live NOW! It's all Dirty English, the new Fragrance for Men by Juicy Couture. Additional notes include bergamot, caraway, cardamom, marjoram, "santal fatal accord" (includes sandalwood, cedar and vetiver), agarwood and black moss. Juicy Couture Dirty English will reportedly be available in 50 and 100 ml Eau de Toilette and in matching grooming products, including De-Funk Deodorant. You can find testers now at Bloomingdales, where it is also available for pre-order. (quote via bloomingdales, additional information via a carded sample & a helpful salesperson) Update: Juicy Couture Dirty English was developed by perfumer Claude Dir. Update 2: see a review of Dirty English. Other recent launches from Juicy Couture: Juicy Crittoure for dogs. Other recent launches from Avon: Wish of Peace, Wish of Love, Wish of Happiness, Today Tomorrow Always In Love, Cynthia Rowley Flower & Petal. So you got a sample of Dirty English? How was it? Oh good heavens. The Dirty English description should be part of the Prix Eau Faux contest. “Manarchy?” How do you top THAT? Manarchy is AWESOME, isn't it? I just love it. *You have to give the Juicy Couture girls some credit for their crazy sense of humor: mulitcolored lap dogs, Marie Antoinette wigs and a logo like “Smells like couture!” those girls are laughing all the way to the bank! And so agree on JC — I don't love the first scent, but they really do a great job on packaging & advertising. Umm…. I think I saw this tester in Bloomingdales the other day. I remember freaking out, thinking OH GOD I didn't know Juicy had a men's fragrance! I'm so behind-the-times, and I need to go on nowsmellthis as SOON as I get home! Well… haha, I guess I wasn't behing the times. But what I smelled didn't really thrill me. It's as un-edgy as the women's one. Unless there was seriously something I didn't get, I certainly wouldn't call lit anarchic. No, you're ahead — it isn't on the Juicy Couture website yet, and all Bloomies has is an “event” listing. Nope, nothing anarchic (MANARCHIC! ), although I didn't give it a very thorough test. I have to agree that their first scent was a nose burner. I felt like I had been stabbed in the nose countless times by small samurai swords. Who knows, this might be an improvement, but whenever I look at the advertising I think about a bottle full of clumpy, smelly dirt. LOL — but as we all know, JC was a HUGE seller. I'm sure it outdid their expectations by a mile. I own JC and happily wear it often. I just wear it lightly, as not to burn anyone's nose off! LOL! You know, I think this post has finally cemented my perfumista status. I'm at peace with just liking what I like. Even if other people (who's opinions I happen to respect on this board) don't. I'm sure someday I'll look back and say “ugh, I can't believe I used to think that smelled good!”, for now I'll just follow my nose. Yay — good for you, stand your ground! I don't know if I want to smell this, but I love the bottles! I do love the Juicy Bottles. I avoided the JC womens for as long as I could and was given a cutesy sample. I did spray it on, and wanted to hate it, not sure why, is the name Juicy I hate? (might be). But it was okay. Like the Ms. Dior Cherie family, but I like Ms. Dior Cherie and love the bottle..but I digress.. I LOVE the name Dirty English (I teach English as a foreign language and I have to have the bottle. They really know how to package — I'd love to have one of the travel bottles of Juicy Couture myself. Well, if you want an empty of the full size let me know. I've got 2 bottles (gifts) and one is almost empty. You are so sweet! And I'm so picky — I'm after that nifty little metal travel size with the charms hanging off it, LOL! Picky is never a bad thing! And that little bottle *is* way cute – like a tiny zippo or a flask. If I had it I doubt I'd be nice enough to part with it! I wouldn't give it up either if I had one!